This beautiful low-carb strawberry mascarpone parfait tastes great and is packed with goodness. It is a great dessert for Valentine's Day or a special occasion. Strawberries are delicious, fresh, and packed with macronutrients for a healthy dessert or snack. Blueberries and raspberries fit perfectly into a low-carb, balanced menu. Known to famous pastry chefs, mascarpone, a special Italian cheese and a traditional product, gives parfaits a beautiful texture. If you are up for a healthy dessert, you can even make mascarpone at home. You will need tartaric acid, heavy cream, and milk. 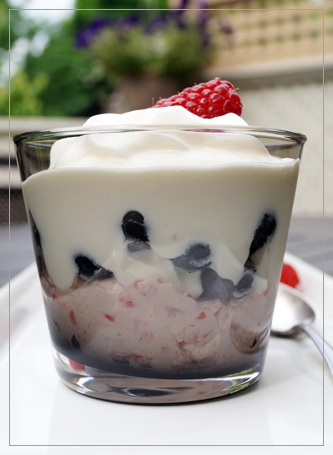 In a bowl, mix the chopped strawberries and mascarpone together with a fork until the mixture starts to turn pink. Set aside. In a separate bowl mix the yogurt and cream. Layer 2-3 tablespoons of the mascarpone mix at the bottom of 4 parfait glasses. Add a layer of blueberries then a layer of the yogurt mix on top. Garnish with whipped cream and raspberry, and serve.